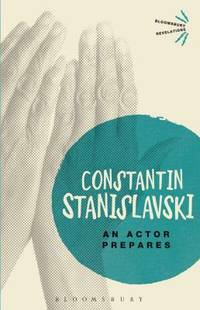 An Actor Prepares was first published in 1936 and is the first volume of the translations of Constantin Stanislavski's books on acting, which were published as a trilogy in English, though originally meant to be published as two books in Russia. "An Actor Prepares" was initially meant to be the first half of a volume on the inner preparation of an actor, while the second half (later published in English as "Building a Character") was meant to cover the outside work on the actor. 1970-03-05. New. Ships with Tracking Number! INTERNATIONAL WORLDWIDE Shipping available. Buy with confidence, excellent customer service! 1980-07-03. New. Ships with Tracking Number! INTERNATIONAL WORLDWIDE Shipping available. Buy with confidence, excellent customer service! New York: Theatre Arts, Inc.. Fair with no dust jacket. 1936. First Edition. Hardcover. Covers are soiled and toned. Spine is stained and splitting. Some foxing. Some underlining and marks in pencil. ; First edition. ; 8vo 8" - 9" tall . Seller: curtis paul books inc.
1989-02-04. New. Ships with Tracking Number! INTERNATIONAL WORLDWIDE Shipping available. Buy with confidence, excellent customer service! 2015-04-05. New. Ships with Tracking Number! INTERNATIONAL WORLDWIDE Shipping available. Buy with confidence, excellent customer service! 2015-04-05. Good. Ships with Tracking Number! INTERNATIONAL WORLDWIDE Shipping available. May not contain Access Codes or Supplements. May be ex-library. Shipping & Handling by region. Buy with confidence, excellent customer service! 1970-03-05. Good. Ships with Tracking Number! INTERNATIONAL WORLDWIDE Shipping available. May not contain Access Codes or Supplements. May be ex-library. Shipping & Handling by region. Buy with confidence, excellent customer service! Routledge. PAPERBACK. 0878309837 . New. 2014. Routledge. PAPERBACK. 0878309837 . New. Theatre Arts Books. Hardcover. B001ESP1OW New Condition. . New. Theatre Arts Books. Hardcover. B001ESP1OW Like New Condition. . Fine. Theatre Arts Books. Hardcover. 0878300015 New Condition. . New. Theatre Arts Books. Hardcover. 0878300015 Like New Condition. . Fine. 2013-05-06. Good. Ships with Tracking Number! INTERNATIONAL WORLDWIDE Shipping available. May not contain Access Codes or Supplements. May be ex-library. Shipping & Handling by region. Buy with confidence, excellent customer service! Routledge. PAPERBACK. 0878309837 New Condition. . New. Methuen Drama. PAPERBACK. 0413461904 New Condition. . New. 1989-02-04. Good. Ships with Tracking Number! INTERNATIONAL WORLDWIDE Shipping available. May not contain Access Codes or Supplements. May be ex-library. Shipping & Handling by region. Buy with confidence, excellent customer service! Routledge. PAPERBACK. 0878309837 Special order direct from the distributor . New. VIII+313 pp. 22,3x14,5. Encuadernación en tela editorial con sobrecubierta ilustrada. Ed. Geoffrey Bles. London, 1955. New York: Theatre Arts, Inc., 1936. 295 pages. Pencil notations, underlining on some pages, otherwise pages good condition, clean. Endpapers lighlty yellowed. Previous owner's name top of ffep. Grey cloth, black titles. Edges show light wear. Boards lighlty worn. VG. 2nd Printing. Hard Cover. 1980-07-03. Good. Ships with Tracking Number! INTERNATIONAL WORLDWIDE Shipping available. May not contain Access Codes or Supplements. May be ex-library. Shipping & Handling by region. Buy with confidence, excellent customer service! N Y: Theatre Arts Books, 1982. Hard Cover. Very Good/Very Good. Drama/Performance Art A clean, unmarked book with a tight binding. Previous owner's name inside. 296 pages. New York: Theatre Arts Books, 1975. 295pp. An unread copy. Slight rubbing at the edges of the dust jacket.. Twenty-Seventh Printing. Hard Cover. Fine/Near Fine. 8vo - over 7¾" - 9¾" tall. Methuen Drama. PAPERBACK. 0413461904 Like New Condition. . Fine. Routledge. PAPERBACK. 0878309837 Like New Condition. . Fine. New York: Theatre Arts, Inc., 1942. 295 pages. Translated by Elizabeth Reynolds Hapgood. Pages clean, good condition. Endpapers yellowed at edges, otherwise clean. Green cloth, black titles. Spine soiled, discolored. Edges of boards lightly discolored and worn. Corners lightly bumped. GOOD+. Fourth Printing. Hard Cover. Routledge, 1989-04-30. Reprint. Paperback. Used:Good. Routledge. PAPERBACK. 0878309837 signs of little wear on the cover. . Very Good. Routledge. PAPERBACK. 0878309837 Minor shelf wear . Very Good. New York, NY: Theatre Arts Books, 1959. 1st Edition 5th or later Printing. Hardcover. Near Fine/Very Good. 8vo - over 7¾ - 9¾" tall. Theatre Arts Books, New York. 1959. Hardcover. Stated 17th Printing November 1959. Book is tight, square, and unmarked but for former owner name stamp on FFFP. Book Condition: Near Fine; suntanning to spine. DJ: Very Good; NOT Price Clipped ($3.50); light chipping at spine; chipping and small missing pieces at tail; suntanning of spine and rear panel. Gray cloth boards and spine with black lettering on spine and front board. 295 pp 8vo. The DJ front panel carries the seagull which represents the Moscow Art Theatre. This book, a classic in it field, is helpful not only to persons working in the theatre, but also to novelists, composers, sculptors, to anyone anxious to understand himself and other people. His psychological survey of acting defines the subtle difference between the competent but hackneyed performance and the divine inspirational acting which breeds communion and oneness with the artist and his audience. A clean very presentable copy. Routledge. PAPERBACK. 0878309837 BRAND NEW, GIFT QUALITY! NOT OVERSTOCKS OR MARKED UP REMAINDERS! DIRECT FROM THE PUBLISHER!|0.86 . New. BLOOMSBURY. New. Very good condition. Theatre Arts Books, 1970. Hardcover. Good. Disclaimer:A copy that has been read, but remains in clean condition. All pages are intact, and the cover is intact. The spine may show signs of wear. Pages can include limited notes and highlighting, and the copy can include previous owner inscriptions. At ThriftBooks, our motto is: Read More, Spend Less.Dust jacket quality is not guaranteed. Bloomsbury Academic, 2013. Paperback. New. Bloomsbury, 2019. Paperback. New. Brand New, Never Used, IN-STOCK, Well Packed. Orders ship the same or next business day. Shipping should take from 3-4 business days within US, Canada, UK, and other EU countries, 2-3 business days within Australia, Japan, and Singapore. Customer satisfaction guaranteed. Mail us if you have any questions. Berg Pub Ltd. PAPERBACK. 1780938438 Brand New ,Original Book , Direct from Source , Express 5-8 Business days worldwide Delivery. . New. Theatre Arts Books, 1970. Hardcover. Good. Disclaimer:A copy that has been read, but remains in clean condition. All pages are intact, and the cover is intact. The spine may show signs of wear. Pages can include limited notes and highlighting, and the copy can include previous owner inscriptions. The dust jacket is missing. At ThriftBooks, our motto is: Read More, Spend Less. Routledge. Near Fine. 1989. Reprint. Paperback. 9780878309832 . Theatre Arts, 1969. Introduction by Sir John Gielgud. (23d ptg.) Slightly smaller book, gray cloth with black lettering, small brown spots at spine bottom, 295 stiff lightly browned pages. DJ dark gray background, small abstract illustration of gull on front right, list of Stanislavski books on back, white back very slightly browned and very slightly soiled. DJ has slight wear to top front tip, 3/8" tear at top front edge with very slight wear, two thin scratches at bottom front, tiny tear and tiny nick with very slight wear at spine top edge, tiny tear at spine bottom right edge. Near Good DJ/Very Good book.. Cloth. Very Good/Near Good. Berg Pub Ltd, 2013. Paperback. Acceptable. Disclaimer:A readable copy. All pages are intact, and the cover is intact. Pages can include considerable notes-in pen or highlighter-but the notes cannot obscure the text. An ex-library book and may have standard library stamps and/or stickers. At ThriftBooks, our motto is: Read More, Spend Less.Dust jacket quality is not guaranteed.